The translation industry is growing by leaps and bounds and the world grows smaller every day. With the birth of the European Union, the growth of NATO and the United Nations, and the ever-growing popularity of the Internet, international boundaries become less and less of a barrier to global business and economy. With changes in global business and commerce comes an increase in demand for translators and information on the translation industry. As such, the number of books available on the industry has also increased. The following are just a sampling of the books available on the market today about the translation industry. 1. Translation as a Profession by Daniel Gouadec. John Benjamins Publishing Company; Reprint edition (November 15, 2010.) This book discusses and analyzes the translation industry. It walks you through becoming a translator, finding a market for your services, landing clients, as well as certification and ethics. Current issues with training for translators are also discussed, as well as the effects of globalization on the translation industry. 2. Translation in Global News by Esperance Bielsa and Susan Bassnet. Routledge Publishing; 1 edition (November 19, 2008.) This book covers a different aspect of the translation industry: those involved in translating for mass media. In light of globalization and other international trends, how texts are translated and presented to the masses is framed by religious views, political climates, and other factors. How do these cultural differences affect the translation industry and what changes should be initiated? 3. 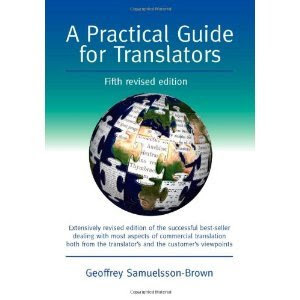 A Practical Guide for Translators by Geoffrey Samuelsson-Brown. Multilingual Matters; 4 edition (May 28, 2004.) Now in its fourth printing and with a sequel, Managing Translation Services, the author walks professionals through setting up a solo translation practice, all the way through to establishing a translation service provider company. All areas of the translation industry are covered, including issues resulting from ethical dilemmas common in the industry, to the effects of global business on translators. Samuelsson-Brown is a Fellow of the Institute of Translation and Interpreting, as well as the Institute of Linguistics. He is also a member of the Swedish Association of Professional Translators, giving him extensive insight into the translation industry. This books is also required by the Certified Translation Professional (CTP) Program. These books are but a sampling of the many texts available on the translation industry. The US Bureau of Labor Statistics predicts the translation industry will experience a growth rate of 22% in the US alone by 2018. As such, there is growing interest in and publications discussing the translation industry as a whole. Tags: Translation Industry Books, Translation Books, Books on Translation, Books on the Translation Industry.